Charts in VBA are a bit weird: this blogs highlights some of their foibles, by showing how charts are really just special shapes, which contain shapes of their own! 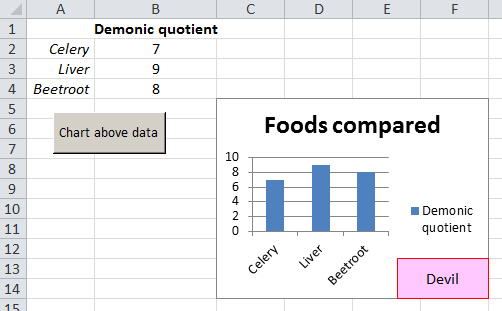 Inspired by a recent course question (thanks, Jen) I thought I'd share my thoughts on how to create a chart, add a textbox to it and copy the whole caboodle to Word - all using VBA. You'll need to know some VBA to make sense of this blog, and obviously know Excel too. Note that you can download the file containing this code here. 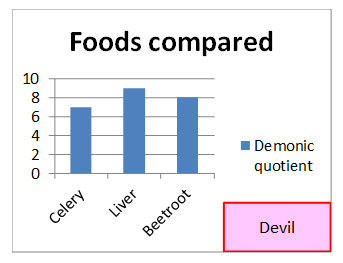 A worksheet comparing 3 devil foods. The clever thing is that the textbox at the bottom right is part of the chart, and so is copied with it to Word. 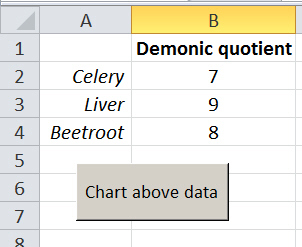 If you just want to create the chart in Excel, you can skip this step. You can see more on referencing other applications in VBA here. This works because embedded charts on a worksheet are actually shapes - but shapes with a particular charty type! I've made the variable c a public variable here, so that I can use it in more than one procedure. Adds a new chart (as a shape, naturally), and at the same time sets the variable called s to refer to this new shape. Sets the variable c to refer to the shape as a chart, rather than just a shape. If you think the above doesn't make much sense, you're not the only one! This shows that the chart has been successfully named. This diagram shows where the chart will end up. I know want to add the text box shown above. The critiical thing is to add it into the collection of shapes contained within the chart, rather than as a separate shape on the worksheet. The reason for this is that when you copy the chart you will also copy (obviously) any shapes that it contains - including your textbox. Hopefully it's reasonably obvious what the lines above do. Note that the VBA code copies the chart's parent shape, not the chart itself. And that's it!